Sadly, there's too much which is off-putting here, including very high pricing, connection errors, and a lack of any detailed help online for when things do go wrong. TotalVPN is a brand of the Endurance International Group, the company behind names such as Homestead, JustCloud and Typepad. The service offers just one commercial product, Total Premium, with a fairly standard VPN specification: 30+ supported locations, no bandwidth or data caps, three simultaneous connections and protocol support for PPTP, OpenVPN, L2TP/IPSec, SSTP and IkeV2. This should work almost everywhere, including Windows, Android, iOS, OS X, and apparently a Chromebook app is "coming soon". TotalVPN's £4.99 ($6.49, AU$8.73) per month headline price appears low, but look closely and you'll see it's a special offer for the first month only, and doesn't even include VAT. The regular cost is £17.96 ($24, AU$31) for a single month, £14.36 per month if you sign up for a year – meaning you'll pay £172.32 ($224, AU$302) per year. Alternatively, it's £11.96 per month if you commit to a two-year contract, which works out at £143.52 per year ($188, AU$250). You might think that kind of premium price would guarantee an amazing service, but apparently not. Once you've signed up you're offered extras like 'SuperCharge', which gives you access to "super-fast servers" for a further £24.95 ($33, AU$44) for the first year, £49.90 ($66, AU$88) after that. You can at least sample the service with a basic Free account, though. There's limited bandwidth, a data cap, three servers and one device supported only, but it should give you an idea of Total VPN's abilities. 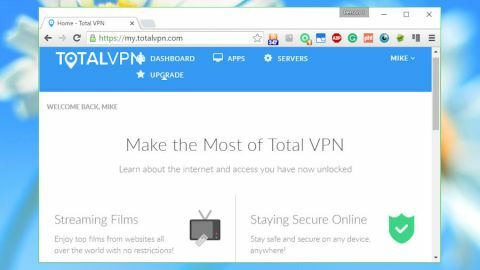 To sign up for a TotalVPN account you must provide an email address, and payment must be via credit card or PayPal. Those are fairly standard clauses, and TotalVPN points out that it doesn't "collect information concerning the content you transmit through the Services or the specific websites that you visit". But it's also worth noting that your personal or account information may be maintained and processed by "third party service providers in the U.S. or in other jurisdictions". Although they're not authorised to "use or disclose personal information for their own marketing or other purposes", TotalVPN notes it will disclose information "about users upon a valid request by government or law officials". TotalVPN's PC client seems straightforward, allowing connection by a specific location or purpose (security, speed, P2P). Unfortunately this didn't always work for us, as we saw regular "failed to connect errors", and reviews on iTunes and Google Play suggest we're not alone. The TotalVPN website has a 'knowledge base' which tries to help, but it's not very detailed. There was no specific mention of the error messages we saw (a raw "exception of type ... was thrown"), and the core of the advice is really just to try a different protocol or connect via another network. When we managed to connect, TotalVPN failed our DNS leak test. We're not sure why – others have said this doesn't happen for them, and if you're using another device perhaps you'll have more luck – but we couldn't find any tweaks or settings to help. Performance was reasonable in our tests*, with latency increased by 166% compared to normal, and upload speeds were 60% and downloads an acceptable 82% of our regular speeds. TotalVPN has a good-looking client and is easy to use, but its few servers, average speeds, technical problems and ridiculously high price suggest you'll be better off elsewhere. *Our testing included evaluating general performance (browsing, streaming video). We also used speedtest.net to measure latency, upload and download speeds, and then tested immediately again with the VPN turned off, to check for any difference (over several rounds of testing). We then compared these results to other VPN services we've reviewed. Of course, do note that VPN performance is difficult to measure as there are so many variables.